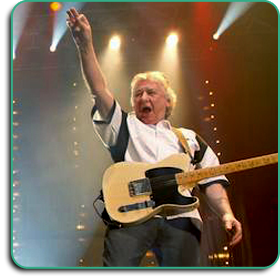 English guitarist and songwriter Mick Ralphs was a founding member of rock bands Mott The Hoople and Bad Company. From Herefordshire, on the English/Welsh border, by his teenage years Ralphs was already playing guitar with a blues-rock group called The Buddies, who released a single in 1964. The Buddies featured Stan Tippins on vocals and, over time, Ralphs and Tippins joined Pete Overend Watts (guitar), from The Soulents, to form The Doc Thomas Group. The group were offered a recording contract with the Italian label Dischi Interrecord, and released an eponymous album in January 1967. By 1968, drummer Dale Griffin (also from The Soulents) and organist Verden Allen had joined the band. Although the group toured and recorded in Italy as The Doc Thomas Group, their gigs in the UK were played under the names of The Shakedown Sound, and later as Silence. Silence recorded demos at Rockfield Studios in Monmouth, Wales, which were shopped to EMI, Polydor, Immediate, and Apple with no success. The group came to the attention of Guy Stevens at Island, who liked the group but not Tippins as lead singer. Advertisements were placed ("Singer wanted, must be image-minded and hungry"), and Ian Hunter was eventually selected as lead singer and piano player. Tippins assumed the role of road manager. Dubbed Mott The Hoople after a cult novel by Willard Manus, the band signed to Island Records, recording four albums, none of which sold in large quantities. The band was a very popular live attraction however, and attracted many ardent fans, including David Bowie. In early 1972, they faced the end of the road when Bowie presented them with his song All The Young Dudes. Leaving Island and signing to CBS Records, All The Young Dudes became the first in a string of hit singles for Mott. In 1973, Mick left Mott The Hoople to pursue a more hard-rock direction, forming Bad Company with former Free musicians, vocalist Paul Rodgers and drummer Simon Kirke. The lineup was completed by former King Crimson bassist Boz Burrell. Their debut single Can't Get Enough, a Mick Ralphs composition, was an immediate hit and pushed the group's 1974 debut album to number one in the US. Ralphs continued to record and tour with Bad Company until they folded in 1982, when Rodgers announced he was leaving the band. In 1984, Mick toured with Pink Floyd guitarist David Gilmour on Gilmour's 'About Face' tour. Ralph's 1985 solo album Take This featured bassist Micky Feat and his fellow Bad Company member, drummer Simon Kirke. Ralphs played only four gigs in support of the album, but his live band consisted of guitarist Dave Colwell (later to join Ralphs in a reformed Bad Company), Uriah Heep drummer Chris Slade and Ozzy Osbourne keyboard player Lindsay Bridgewater. Prior to rejuvenating Bad Company, Ralphs joined Cold Turkey, an act that lasted just one gig. Bad Company reformed and split several times through the 1980s and 1990s, but Ralphs finally quit for good in 2000. He then announced a hiatus from touring, something he was never comfortable with in either band, since he has a fear of flying. In 2001, Ralphs released his second solo album, the all-instrumental It's All Good, on the Angel Air Records label. Two years later his That's Life  Can't Get Enough album was released, including a demo version of Can't Get Enough. In 2004, he once again teamed up with former Mott colleague Ian Hunter, playing second lead guitar (along with Andy York) on Hunter's UK tour. Ralphs performed at Hunter's 2005 concert at the London Astoria, with Ralphs performing a guitar solo on All the Way From Memphis. On 2nd July 2008, it was announced that the original line-up of Bad Company (minus Boz Burrell, who died in September 2006) would do a one-off gig at the Seminole Hard Rock Hotel and Casino in Hollywood, Florida on 8th August 2008. According to Paul Rodgers, they did this gig in order to 'protect the legacy they have built and cement the rights to the trademark Bad Company for touring'. The now regular line-up of Bad Company includes Ralphs, along with Rodgers and Kirke. The original lineup of Mott The Hoople, including Mick Ralphs plus Ian Hunter, Verden Allen, Pete Watts and a fragile Dale Griffin on the encores, reunited for two shows at the Blake Theatre in Monmouth in September 2009. The band had rehearsed close by, at Rockfield Studios, before playing five sold-out concerts at London's Hammersmith Apollo in October 2009. Mick's most notable songwriting credits include Ready For Love (Mott The Hoople and Bad Company), Can't Get Enough, Good Lovin' Gone Bad, One Of The Boys with Ian Hunter, Feel Like Making Love with Paul Rodgers, Flying Hour with George Harrison, and Oh, Atlanta (recorded originally by Bad Company on the album Desolation Angels; but covered more recently by Alison Krauss).